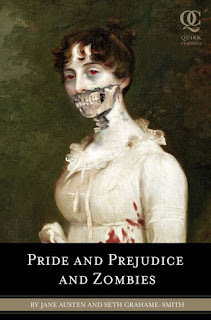 Releasing this April in novel form is "Pride and Prejudice and Zombies" by Jane Austen and Seth Grahame-Smith. Seth Grahame-Smith who had previously written "How to Survive a Horror Movie" brilliantly took Austen's classic novel and inserted "all-new scenes of bone-crunching zombie action." The offical synopsis reads: As our story opens, a mysterious plague has fallen upon the quiet English village of Meryton—and the dead are returning to life! Feisty heroine Elizabeth Bennet is determined to wipe out the zombie menace, but she's soon distracted by the arrival of the haughty and arrogant Mr. Darcy. What ensues is a delightful comedy of manners with plenty of civilized sparring between the two young lovers—and even more violent sparring on the blood-soaked battlefield as Elizabeth wages war against hordes of flesh-eating undead. Complete with 20 illustrations in the style of C. E. Brock (the original illustrator of Pride and Prejudice), this insanely funny expanded edition will introduce Jane Austen's classic novel to new legions of fans. Eventhough the book is yet to release studios are moving quickly to scoop up the rights to the film. Today Production Weekly reported that Natalie Portman was attached to the film. Shock Till You Drop however quickly debunked the claim by calling their contact who replied, "Premature. No offers or handshakes of any kind yet - other people circling." Although, the statement denies Portman as being casted, it does prove that the film is being heavily sought by a number of studios. As we have become acustom to with Hollywood, everything comes in pairs. We all remember the terrible disaster films Dante's Peak and Volcano? Or how about Mission to Mars and Red Planet? A couple of my favorites Deep Impact and Armageddon. Can't forget the animation pairing of Antz and A Bug's Life or Shark Tale and Finding Nemo. The list continues with The Illusionist and The Prestige, Capote and Infamous, The Truman Show and EdTv, Turner and Hooch and K-9 and who could ever forget those teenage TV sensations in their body swaping movies Like Father like Son and Vice Versa with Kirk Cameron and Fred Savage. All of these films released within the same year of eachother, but still Hollywood continues to plague us with movie pairings as if we forgot what we had just watch 4 months prior. 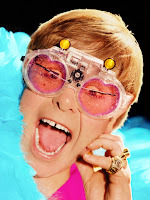 Continuing with longtime trend Variety reports that Sir Elton John's Rocket Pictures will make "Pride and Predator." "Pride and Predator," much in the same vein as the novel previously noted in this article will take Jane Austen's classic novel and introduce an alien that crash lands in the period drama. The film is set to shoot later this year in London and has Will Clark set to direct the script he previously wrote with Andrew Kemble and John Pape. John's partners Steve Hamilton Shaw and David Furnish are producing. Furnish spoke about the adaptation, "It felt like a fresh and funny way to blow apart the done-to-death Jane Austen genre by literally dropping this alien into the middle of a costume drama, where he stalks and slashes to horrific effect." Of the two premises the Zombie idea sounds much more enjoyable. There is no telling which idea came first, but I'd put my money on Seth Grahame-Smith. Furthermore, I would bet that Elton's film is gonna need a title change. I doubt 20th Century Fox will allow a creature called "Predator," which is described just like the alien in the original Predator film, to happen without a name change. GB 3 Shooting in Fall? Rockwell on Trial in "Waters"
Could this be the New Freddy? Jonah Hex has it's Villain! Will a Repo! Sequel Happen? He-Man and the Kung Fu Panda! Bale Raged on Terminator Set!